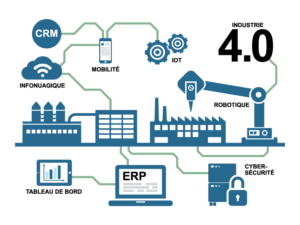 What is the 4.0 industry? As Wikipedia defines, the concept of the 4.0 industry seems in a new way to organize the means of production. With the objective of attracting consumers by offering them unique and personalized products (Smart Product), the industry of the future also aims to maintain gains, including on weak manufacturing volumes. To achieve this, this industrial revolution involves production processes which associate innovations linked to the internet of things (IOT) and other digital technologies such as the cobotic, 3d impression, augmented reality or even artificial intelligence (IA) with the purpose of using data from Big data and the digital model. Furthermore, the 4.0 industry also aims to make consumers interact with machines throughout the phases of creating products which are intended for them. This type of ‘’Smart Product’’ production involves implementing sensors (RFID are the most frequent), consisting of system base elements acquisition and Supervisory Control and Data Acquisition (SCADA) System in an industrial automation context. First of all, the technological landscape has development quickly. This rapid development creates new technical problems, but also new ways to organize work and to affect company human resources. The impact of the cloud, big data, virtual reality, natural language processing (NLP), automation and artificial intelligence are particularly apparent in the area of work. According to a recent global survey led by The Workforce Institute, four collaborators out of five think that the deployment of Artificial Intelligence makes work more stimulating but are anxious about the consequences of the integration of these new technologies, particularly on employability of workers. Companies involved in the 4.0 industry have therefore for a first ambition to prepare their partners and adapt their company cultures, in particular to benefit from I.A. An example is a recent initiative in this domain, the factory project of the future presented to these shareholders by the company Celxtral, manufacturing extruded foodstuffs and from pastry to banknotes. Aimed to welcome all employees on only one site (baptised Ondaine), the Clextral project also includes an academy, a school of technology, created to ensure high-level training for employees but also for customers. In the environment of the 4.0 industry, many security elements must be taken into account. First and foremost, as in all industrial processes, the systems of production have importance demands in matters of reliability, availability and robustness. The first goal is, therefore, to avoid breakdowns and dysfunctions that could occur. Moreover, it is important to assure that the production installations don’t present any danger to people or the environment, but also to data and information they contain. Data must, therefore, be absolutely be protected against abusive use and non-authorized access. It’s not by chance that the Internet of Things is also nicknamed Internet of Threats. The first risk concerns industrial espionage and its sometimes devastating effects, but that’s not all. In fact, a weak level of encryption in the cloud environment constitutes a serious problem because a hacker or an organisation can bring down and stop many companies – and not only one site. An extreme example is the deployment of Stuxnet 41, this virus which would have been generated to stop the Iranian nuclear program. The virus, largely diffused, would have stopped one fifth of Iranian centrifuges and in this way delayed the ability of Iran to manufacture its first nuclear arms, according to the military experts and information quoted by the New York Times. What are the new data security tools of the 4.0 industry? The first actions of security concern the applications hosted in a cloud. It’s in fact necessary to predict for them in an operating environment, providing an end-to-end security solution for users. In this way, the use of a virtual private network (VPN) is required for an exchange of secure data. Moreover, the protocols TLS (Transport Layer Security) and SSL (Secure Socket Layer) are used to transfer information between the machines and the cloud producer company. In fact, new advances in the area of multi-cloud or hybrid cloud now authorize a functional environment to apply these first security procedures. Another way concerns the secure identification and authentication through the means of cryptographic keys between the users and the machines. Among the most recent functional devices are the new multiprotocol Time Sensitive Networking-compatible processors of Texas Instrument. Providing necessary flexibility to respond to the sector’s developments, these systems of industrial communication would be, according to the firm, able to conceive functional security modules. Besides proposing micro-controllers, able to function in Lockstep mode and linked to diagnostic libraries, these processors have memory protection with error correcting codes. What’s more, new processors of Texas Instrument would present security of the system on a reinforced chip, particularly thanks to initialisation functions and storage, linked to intelligent encryption motors to reinforce system security even more. Optimism, like vigilance, remains high. If it is true that dogs or little squirrels can be electrocuted with electricity, then lamps, wells, cars, washing-machines, incubators, heated mittens, pancake pans or even guitars can also be operated with this same energy. The arrival of new threats concerning used data protection by the 4.0 industry is therefore far from constituting an insurmountable obstacle which would be susceptible of leaving us without industrial progress, promising spectacular societal advances.